MANILA, Philippines - The official results, list of passers, top examinees and other important announcements for March 2018 Civil Service Exam - Pen and Paper Test (CSE-PPT) both for professional and subprofessional levels are released by the Civil Service Commission (CSC) within sixty (60) days after the eligibility examinations. 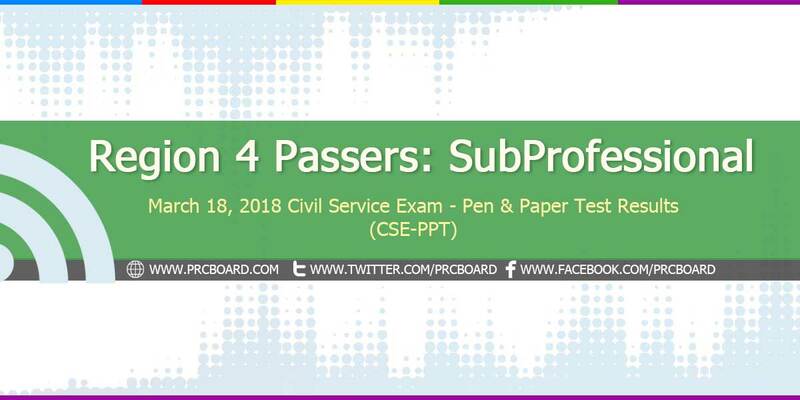 Below is the complete list of passers for March 2018 CSE-PPT Subprofessional Level in Region 4 (CALABARZON & MIMAROPA). Excited to see the result but feeling nervous at the same time. waiting for the result. feeling nervous too. Pass or failed this would be the last after several takes, maybe the lord has a better plans. Thank you lord. thank you papa jesus d mo ako pinabayaan! pasado na ko. Yes pasado na aqo, yahoo!!!! WOW! MAY RESULT NA AND I THANK GOD.. PASADO AKO!!!!!!!!!! pano po makita ang results? Sa cainta po ako nagtake . Dto po ba lalabas ung result?